The Ant-Man films are outliers in the Marvel Cinematic Universe. They feel far more self-contained than the sprawling, interconnected capers featuring the other superheroes. 2015's "Ant-Man" and its sequel, "Ant-Man and the Wasp," are instead local, family-oriented stories. They even manage to make the stakes appropriately-sized, which is ironic, given how much Ant-Man (Paul Rudd) and his new partner, The Wasp, enjoy playing with the scale and proportion of everyday objects. The film does kick off with one doozy of a connection to the rampaging posse of The Avengers. Scott, better known as Ant-Man, is at home outfitted with an ankle bracelet, under house arrest for his participation in the smackdown in "Captain America: Civil War." 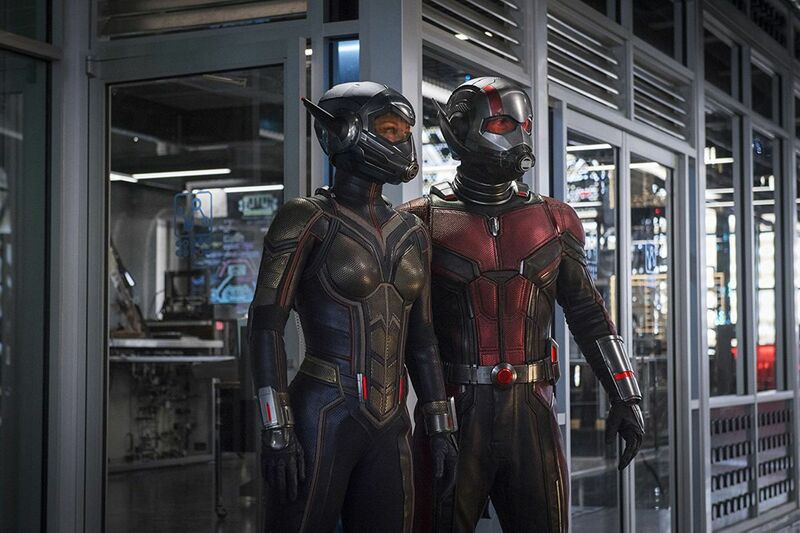 He's lost touch with Hank Pym (Michael Douglas), the scientist who invented his size-swapping Ant-Man suit, and Pym's enterprising daughter, Hope (Evangeline Lilly), who has stepped into her mother's suit as The Wasp. He wiles away the hours playing with his adorable daughter (Abby Ryder Fortson), counting down the days until he's out from under the watchful eye of Agent Woo (Randall Park). "Ant-Man" was the story of fathers reconnecting with their daughters, and in "Ant-Man and the Wasp," the father-daughter theme once again drives the story, but mom's in the mix, too. Hank and Hope are determined to save Hope's mother (Michelle Pfeiffer) from the sub-atomic realm, where they lost her decades ago. And since Scott went sub-atomic, they think he's the link to her location. They've got all the technology in their handy lab, which helpfully shrinks to portable briefcase size when needed, and they just need a couple of hours to make the connection. The plan is complicated with two nefarious types trying to get their hands on the lab and the tech inside it: their shady components dealer Sonny Burch (Walton Goggins), and a mysterious hooded figure, Ghost (Hannah John-Kamen), who can phase through matter. Burch wants the lab for its value, and Ghost for what it contains — a possible cure for her debilitating, constant particle phasing. It becomes a big game of chase through the streets of San Francisco, made all the more entertaining through the constant size-shifting both Scott and Hope get up to. The appeal of "Ant-Man" is simple: normal-sized things such as people, objects, buildings and cars get smaller or bigger, and that's fun to watch in the context of an otherwise routine scene — especially fight scenes. Both movies, directed by Peyton Reed, with star Paul Rudd the only returning co-writer, hit all the beats we expect. But, there's a fresh sense of looseness, lots of play and pockets of weird humor, like Scott's buddy/business partner Luis (Michael Pena) and his penchant for epic yarns. There's even a running joke about fabled witch Baba Yaga, and a bit where Ant-Man's regulator stops working and he ends up toddler-sized while staking out his daughter's school. That's the stuff that makes "Ant-Man and the Wasp" really sing — not sting. There are no limits to Rudd's easy charms, and he's surrounded by a cast that makes it look easy. Pena is once again a standout, and Park almost takes that crown from him this time around. But his best scene partner is right there in the title. Lilly owns the role with such style, grace and power that Ant-Man had better make room on that billing block for The Wasp. Cast: Paul Rudd, Evangaline Lilly, Michael Douglas, Michelle Pfeiffer, Michael Pena, Lawrence Fishburne, T.I. Rated PG-13 for some sci-fi action violence.